The items on this list are essential for any store owner to go through before launching their online store. We’ve covered some of these topics before and this post is to serve as a must-be checklist in order to ensure flawless user experience. Note: This post is dedicated to the store owners in general, mainly without any technical knowledge in terms of web development. Thanks. 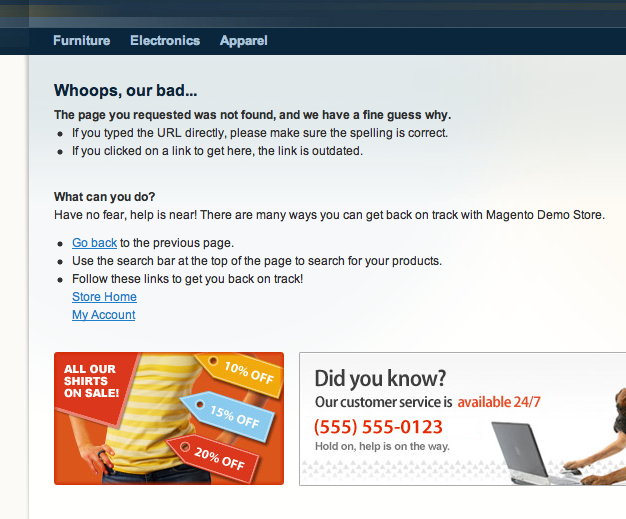 Tip 1: Go to the Admin panel to the CMS – > Pages and from the list of the pages click on the 404 page. Change the text to better suit your needs and yes please remove the dog and the shirt images or replace them with your own special banners. for the right callout. You’re done. BTW you can to all of these steps directly from the page.xml file but this is I believe easier for everyone to understand. Tip: While you’re there you can disable any of the functionalities you won’t be using. It will definitely keep things simpler and the house clean. This one is so important that it has it’s own post on how to set those emails properly. We’ve explained in detail how to set them up and how to apply them to different stores and store-views. If you’re gonna be contacting your customers via the Magento’s biult-in newsletter system be sure to check Toni’s post on setting it up. Oh boy, this one definitely falls in the category of major oversights when launching the store or, ehm, even after the store is launched. Tomislav wrote very informative article about it including other three popular oversights like the store favicon and the infamous missing “Google Analytics”. Store email address definitely deserve your attention since you’ll need to change the default @EXAMPLE.COM addresses from the Magento admin. This reflects the sales emails as well so this one is a must have before any sales take place. Tip: Go to System -> Store Email addresses and change both the names and emails to start selling. These to pages mean a lot to your new customers in terms of establishing a relationship of trust since you’ll be providing the answers that deserve to be answered before any shopping is done. Clearly stating which payment options are available before the customer is already at the checkout is of great importance since it will save time for you and your customer. one example is when the customers reaches the payment part in the checkout and realizes that he/she can’t pay ’cause none of the options suit them. Having a footer banner with accepted payments logos will remedy that situation and provide a win/win situation for all. The same applies to shipping options and one thing to do about it would be to make a separate CMS page where you’ll be stating the payment options and/or shipping options. Tip: Payment methods: Payment Methods -> Saved CC – Change the “Enabled” option to no if you want to avoid the liability of storing credit card numbers even if they are encrypted. It’s optional but for obvious reasons strongly recommended. That’s it. No, of course not. With store owning and maintaing a reputable business there is always one more thing that you can do for you and your customers. It’s often those little things that make a difference so don’t put them aside. Do those last things first. Cheers! Just found this awesome checklist! One other thing I forgot to do was to disable the Free Shipping option we were using for test orders, which the first customer obviously selected. @Giannis Thank you, I’m glad it helped you and be sure to check the items @loopion mentioned. Thank you so much for this post. I hoped there would be sth like that at the end of the “Official Magento User Guide” but nope… I’m so glad I found you. Thank you. I’ve seen so many awesome Magento stores that didn’t change the default favicon that I can’t count it anymore. This is a nice reminder checklist for the things that are often forgotten.